There's been a lot of questions floating around the upcoming "Wonder Woman" movie, why it was being promoted so lightly, why its box office projections were so low, and most of all, would it be any good? Well, the social media embargo on the film has lifted in the U.S. and critics who have seen the film started sharing their thoughts almost instantly, and it was pretty unanimous: Things are looking good for the DC Comics cinematic universe. 2. Gal Godot is absolutely phenomenal as #WonderWoman. She KILLS it, just surprisingly good. A truly heroic light DCEU desperately needs. 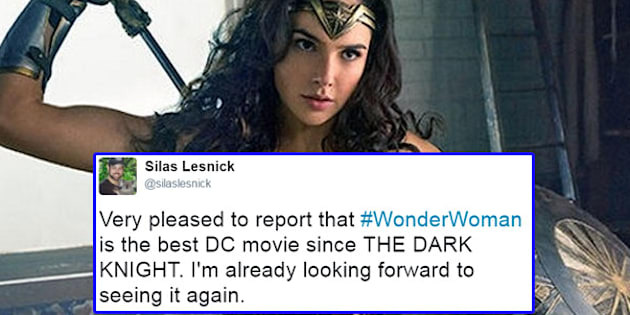 After "Batman Vs Superman" and "Suicide Squad" were both torn apart by critics, and became incredibly divisive for comic book loves and film fans alike, there was a lot of concern for the "Wonder Woman". Also, somewhat unfairly, a lot rested on Gal Gadot's shoulders with "Wonder Woman" being the first female-led solo solo superhero film. Despite Marvel's attempts at diversity, their leading roster won't have a woman at the forefront of a film until 2019 with "Captain Marvel". While this isn't Gadot's first outing as Wonder Woman, aka Princess Diana of Themyscira, having a small cameo in "Batman Vs Superman", it was the first big investment in the character, and it looks like it paid off. @GalGadot is brilliant as #WonderWoman, so much emotion, sense of humor, and power. I literally teared up 20 minutes into Wonder Woman when I realized it was going to be good. The film also stars Chris Pine and Robin Wright, and follows Diana (Gadot) who meets an American military pilot (Pine) fighting in the first World War. Learning of the current state of the world, Diana leaves her island home to bring an early end to the war. "Wonder Woman" opens in cinemas June 1, and we can't wait.